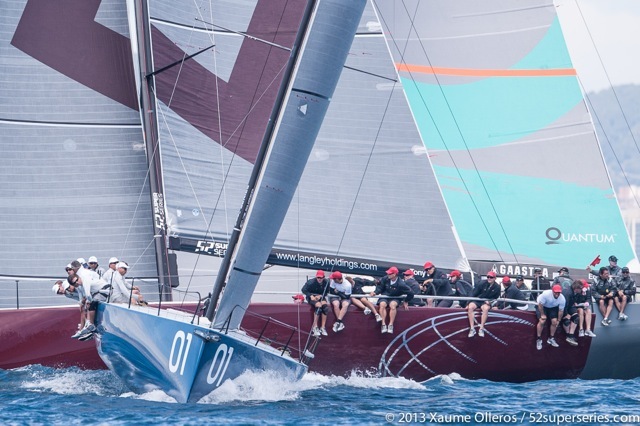 Azzurra, the 2012 52 SUPER SERIES champions, proved they are in close to perfect shape as they start out in Barcelona on the European stages of the 52 SUPER SERIES when they lead Wednesday’s official practice race right up to the finish line. That they chose to bypass the finish line, passing half a metre outside of it, bowed to the prevailing superstitions of the perhaps more vociferous Latinos on board, believing it is unlucky to win the practice race. But, after having established a decent lead by the first windward mark, the champions were not challenged again. Quantum Racing were second all the way around the course, gliding across the line to accept the first gun. With their brand new afterguard line up, Terry Hutchinson as tactician and 1992 Olympic gold medallist and America’s Cup winner Jordi Calafat as strategist, they proved that they are not short of pace in the 10-12 knots breeze, but they might still need just a little more time together to finesse their starting. 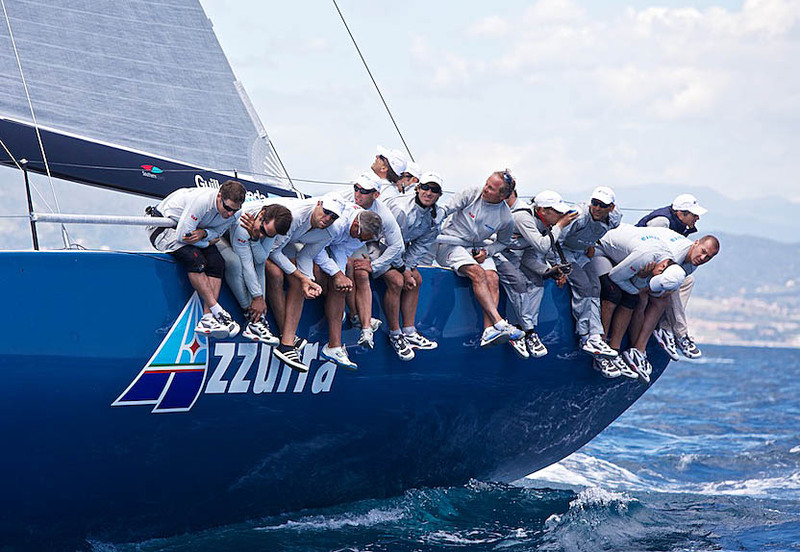 Azzurra, with skipper-helm Guille Parada (ARG) steering, may have made the early jump in the practice race but it was evident that racing between the seven 52’s will be very close. There was very little separating the fleet at the first turn and it is clear that even those who have just joined the circuit recently have the potential to win races. The fleet has grown in size since this time last year and while it is still the circuit and class of choice for some of the very top names in world sailing, so too there are more amateur, Corinthian sailors enjoying their racing here than for many years. Those returning stars with an America’s Cup history include Dee Smith (USA) who sails as tactician on Manouch Moshayedi’s Rio (USA), John Cutler (NZL) previously tactician with Spain’s Desafio is tactician on Austin and Gwen Fragomen’s Interlodge (USA). And on Quantum Racing Terry Hutchinson, new tactician, finds himself as the only former Team New Zealand sailor among an afterguard which is otherwise all derived from Alinghi, the team which eclipsed him and his ETNZ contemporaries to win the 32ndAmerica’s Cup. Hutchinson fits into the all star ex Alinghi posse including skipper-helm Baird, navigator Juan Vila also now Jordi Calafat as strategist, and admits that he is taking some preliminary ribbing from the former Alinghi sailors. 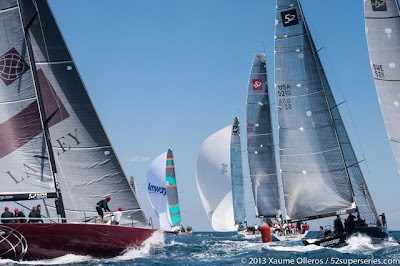 While the sport’s big names are still visibly loving their racing with the flourishing 52’s so too in the fleet there are a big number of hard working ‘amateur’ sailors – that is to say those who do not derive their main income from racing sailboats. Tony Langley, owner-skipper-helm of Gladiator (GBR) still enjoys having a couple of good sailing friends sail with his crew. And on Rio, as well as on Ergin Imre’s Turkish flagged Provezza, which is steered by double Olympic silver medallist Nick Rogers (GBR) with Tony Rey (USA) as tactician, both crews are composed of somewhere around 50-55 percent of ‘amateur’ sailors. While the smart money is probably still riding on Azzurra, on Niklas Zennström’s Rán Racing, the recently crowned world champions, or on Quantum Racing to win overall across the four regatta 52 SUPER SERIES in Europe, today’s evidence showed again that all have the potential to win races, and in time perhaps regattas. Barcelona, and the Conde de Godo regatta in particular, opens the European season with a real challenge. The early season Garbi sea-breeze can be erratic, the winds are seldom well mixed and settled and the influence of the nearby cityscape and interesting topography can all come into play and the tacticians and afterguards be well tested. Racing starts each day at 1300hrs CET with live coverage on www.52superseries.comincluding live tracking and audio commentary. “Its a bit of mixing Team New Zealand with the Alinghi mafia! so every so often ‘ribbing’ takes place! Jordi spends some time up the rig and its simply a matter of gathering the infomation. Then about 7-8 minutes before the start we decide what we want to do in the race and decide the plan. Jordi’s looking up the race course looking where the boat needs to be whilst I am more the ‘boat on boat’ man and Juan helps get the boat off the start line quickly and will help with the lay-lines. At the moment we are stepping on each others toes a bit but we are evolving and I am quite confident we will get there. “I hope that we will do better here than the last two years. Today we did quite well and we hope that this is only the start of a good week for us. Obviously there are always some problems with a southerly here, you are expecting the local Barcelona breeze the ‘Garbi’ to blow in and it arrives and then just as suddenly, it disappers.